After returning to Hong Kong from Shenzhen, it occurred to me that the urban villages of Shenzhen and the Mong Kok area of Hong Kong were similar in its mix-use, low-rise housing developments. Also, Shenzhen’s Central Business District (CBD) was eerily familiar to Hong Kong’s financial district. Both instances in each city are distinctive enough to justify their differences, but because Shenzhen lacks the critical mass present in Hong Kong, this results in these two varying city development and experiential conditions. Critical mass can be observed in the macro scale of a city especially if it has undergone either densification or sprawl. Sprawl allows for individuals a relief from population congestion, but increases the reliance on vehicular transportation. Therefore, it increases congestion on transit routes. On the other hand, individuals living in dense cities do not have this relief, but in exchange have increased efficiency in both pedestrian and vehicular movement. In Hong Kong, there is an apparent density, especially with the clusters of pencil towers soaring 60 floors with pipes relocated to the exterior of the building. Every square meter is valuable and cannot be wasted on unusable space. Hong Kong has a condition of vertical density as a result for horizontal sprawl limitations. However, in Shenzhen, there are housing towers clusters and office buildings, but the proximity of each is quite generously spread apart. Shenzhen was established 30 years ago as an economic experiment, and has since established multiple city centers. Shenzhen has a condition of a continuously sprawling city that has not yet achieved a critical mass of people to occupy its expansive development. 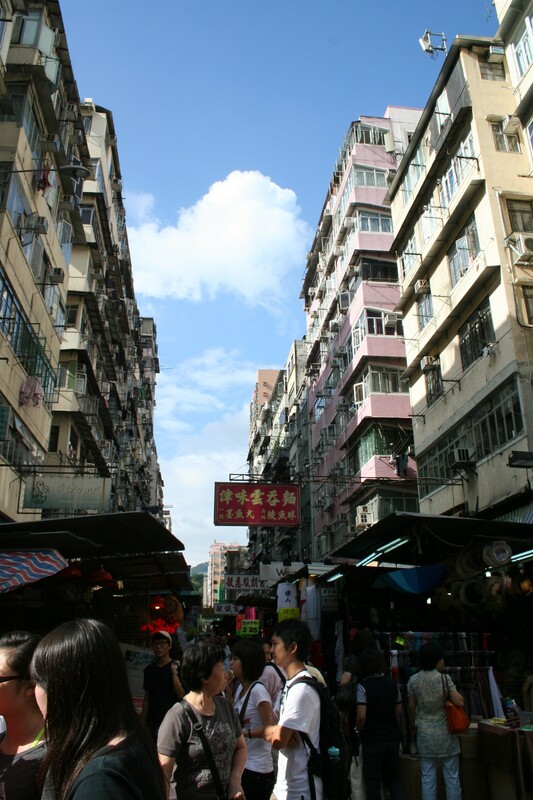 As a result of densification, Mong Kok’s Market Street is bustling with life that extends beyond the sidewalk. An additional layer of temporary structures eats away at the street that was intended for vehicular traffic while the pedestrians take over the residual space. It is the presence of this critical mass that has allowed both the ground floor retail and temporary shops to thrive. Without this critical mass, it would possibly look like the urban villages of Shenzhen. In Shenzhen, each housing development also has ground floor retail and housing above, but lacks the additional layer of temporary market that Mong Kok has. The restaurants and shops are mostly empty and shop owners oftentimes sit outside killing time by playing cards or socializing with their neighbors. Hong Kong’s financial district is lined with overhead walkways to separate pedestrian from vehicular traffic. This allows people and cars to move more efficiently rather than have both occurring on the same level at the same time. However, in Shenzhen, the boulevards are fairly wide and oftentimes littered with jaywalkers impatiently beating the pedestrian light. Sometimes streets have overhead walkways. It is not to make the pedestrian and traffic conditions more efficient, but rather to allow pedestrians to safely cross over the wide avenues if cars are driving at higher speeds. It is difficult to say that density is bad, sprawl is good, and vice versa. Both yield different effects that offer various types of analyses. 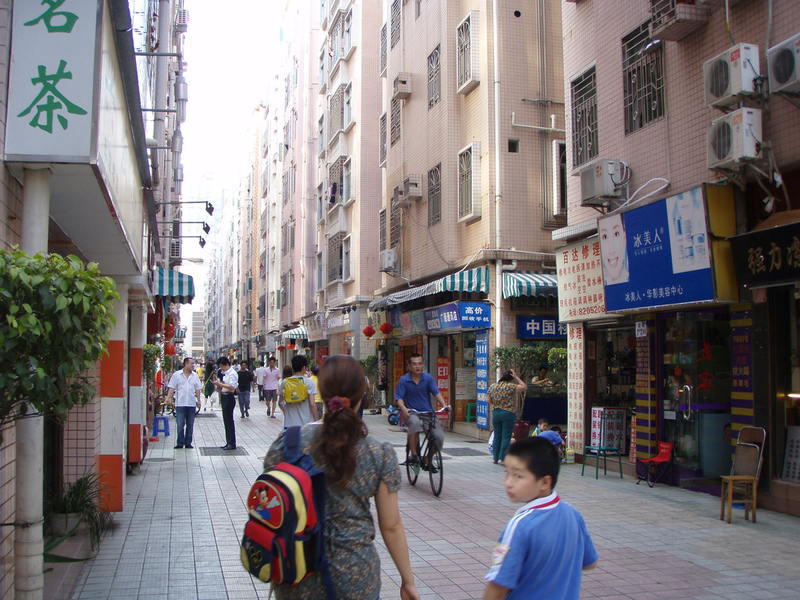 The lack of people in Shenzhen illustrates the importance of having a plethora of individuals occupying the city. Having people in a city is a commodity, and without it, conditions like Mong Kok and the Hong Kong Financial district’s overhead walkways would not have been conceived. Because of people, cities must accommodate for and create ingenious ways to deal with pedestrian, vehicular, and subterranean traffic to make them more efficient and less problematic for all parties. Critical mass allows for these new activities to take off, reinforce itself, and cluster, making a city more layered. The presence of a critical mass contributes to the layering of a city, instigating the interactions between activities that would otherwise be segregated. This level of hybridization is what ultimately defines and dictates the quality of the experience.